Tandon P1, Reddy KR2, O’Leary JG3, Garcia-Tsao G4, Abraldes JG1, Wong F5, Biggins SW6, Maliakkal B7, Fallon MB8, Subramanian RM9, Thuluvath P10, Kamath PS11, Thacker LR12, Bajaj JS12; North American Consortium for the Study of End-Stage Liver Disease. 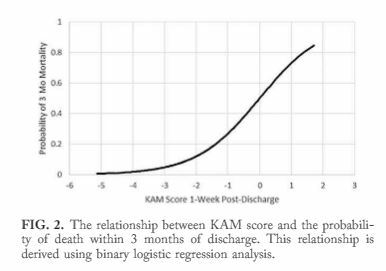 A Karnofsky performance status-based score predicts death after hospital discharge in patients with cirrhosis. Hepatology. 2017 Jan;65(1):217-224. PMID: 27775842.